Self-Care Deficit: Impaired ability to perform or complete activities of daily living for oneself, such as feeding, dressing, bathing, toileting. Activities of daily living or ADLs are defined as “the stuff we regularly do such as feeding ourselves, bathing, dressing, grooming, work, homemaking, and leisure. However, there are some that might have difficulties in performing self-care. Self-care refers to those activities an individual performs independently throughout life to promote and maintain personal well-being. On the contrary, Self-Care Deficit is the inability of an individual to perform self-care. The deficit may be the effect of temporary limitations, such as those one might experience while recovering from surgery, or the result of gradual deterioration that erodes the individual’s ability or willingness to perform the activities required to care for himself or herself. Also, patients who are suffering from depression may not have the interest to engage in self-care activities. Assisting in activities of daily living are skills required in nursing and as well as other professions such as nursing assistants. The nurse coordinates services to maximize the independence of the patient and to ensure that the environment the patient lives is safe and supportive of his or her special needs. Patient identifies useful resources in optimizing the autonomy and independence. Patient demonstrates lifestyle changes to meet self-care needs. Patient recognizes individual weakness or needs. Patient safely executes self-care activities to utmost capability. 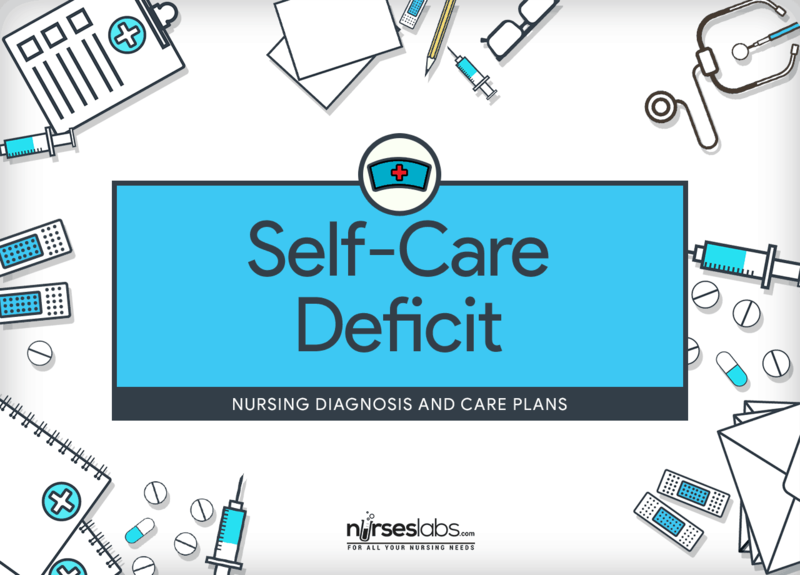 Assessment is required in order to identify potential problems that may have lead to Self-Care Deficit as well as name any episode that may happen during nursing care. Assess the patient’s strength to accomplish ADLs efficiently and cautiously on a daily basis using a proper assessment tool, such as the Functional Independence Measures (FIM). The patient may only need help with some self-care measures. FIM measures 18 self-care items related to eating, bathing, grooming, dressing, toileting, bladder and bowel management, transfer, ambulation, and stair climbing. Determine the specific cause of each deficit (e.g., visual problems, weakness, cognitive impairment). Various etiological factors may need more explicit interventions to enable self-care. Consider the patient’s need for assistive devices. Assistive devices improve confidence in performance of ADLs. Recognize choice for food, personal care items, and other things. The patient will be eager to submit himself or herself to the treatment regimen that supports his or her individual preferences. Evaluate gag reflex or the need for swallowing assessment by a speech therapist prior to initial oral feeding. Absence of gag reflex or inability to chew or swallow properly may lead to choking or aspiration. Verify the need for home health care after discharge. Shortened hospital stay have resulted in patients being more debilitated on discharge and therefore requiring more assistance at home. Occupational therapists have access to a wide range of self-help devices. Monitor impulsive behavior or actions indicative of altered judgment. This may imply the demand for supplementary interventions and management to guarantee safety or security. Establish short-term goals with the patient. Helping the patient with setting realistic goals will reduce frustration. Guide the patient in accepting the needed amount of dependence. Patient may require help in determining the safe limits of trying to be independent versus asking for assistance when necessary. Present positive reinforcement for all activities attempted; note partial achievements. External resources of positive reinforcement may promote ongoing efforts. Patients often have difficulty seeing progress. Render supervision for each activity until the patient exhibits the skill effectively and is secured in independent care; reevaluate regularly to be certain that the patient is keeping the skill level and remains safe in the environment. The patient’s ability to perform self-care measures may change often over time and will need to be assessed regularly. Implement measures to promote independence, but intervene when the patient cannot function. An appropriate level of assistive care can prevent injury from activities without causing frustration. Nurses can be key in helping patients accept both temporary and permanent dependence. Boost maximum independence. The goal of rehabilitation is one of achieving the highest level of independence possible. Apply regular routines, and allow adequate time for the patient to complete task. An established routine becomes rote and requires less effort. This helps the patient organize and carry out self-care skills. Allow the patient to feed himself or herself as soon as possible (using the unaffected hand, if appropriate). Assist with setup as needed. It is possible that the dominant hand will also be the affected hand if there is upper extremity involvement. Ensure the patient wears dentures and eyeglasses if required. Deficits may be exaggerated if other senses or strengths are not functioning optimally. Place the patient in a comfortable position for feeding. Proper positioning can make the task easier while also reducing the risk for aspiration. Provide patient with proper utensils (e.g., wide-grip utensils, rocking knife, plate guard, drinking straw) to aid in self-feeding. These things expand possibilities of success. Assure that the consistency of diet is suitable for the patient’s ability to chew and swallow, as assessed by the speech therapist. Thickened semisolid foods such as pudding and hot cereal are most easily swallowed and less likely to be aspirated. If vision is affected, guide the patient about the placement of food on the plate. After a CVA, patients may have unilateral neglect and may ignore half of the plate. Provide an appropriate setting for feeding where the patient has supportive assistance yet is not embarrassed. Embarrassment or fear of spilling food on self may prevent the patient’s effort to feed self. Provide privacy during dressing. The need for privacy is fundamental for most patients. Patients may take longer to dress and may be fearful of breaches in privacy. Use appropriate assistive devices for dressing as assessed by the nurse and occupational therapist. The use of buttonhook or loop-and-pile closures on clothes may make it possible for a patient to continue independence in this self-care activity. Suggest elastic shoelaces or Velcro closures on shoes. The closures eliminate tying, which can add to frustration. Give frequent encouragement and aid with dressing as needed. Assistance can reduce energy expenditure and frustration. However, care needs to be taken so the care provider does not rush through tasks, negating the patient’s attempts. Utilize wheelchair or stationary chair. Dressing requires energy. A chair that provides more support for the body than sitting on the side of the bed saves energy when dressing. Establish regular activities so the patient is rested before activity. A plan that balances periods of activity with periods of rest can help the patient complete the desired activity without undue fatigue and frustration. Consider the use of clothing one size larger. A large size guarantees easier dressing and comfort. Recommend a front-opening brassiere and half-slips. Clothing that is easier to put on and remove enhances self-care with dressing. For moderate assistance, the caregiver places arms beneath both patient’s armpits with the caregiver’s hands on the patient’s back. This method forces the patient to maintain his or her weight forward. For patients needing maximal assistance, use a gait belt. Raise the bed to the tallest height that still allows the patient’s feet to be flat on the floor. Grasp the gait belt with both arms, and pull the patient forward. Place a knee against the patient’s weak knee (if applicable), and encourage the patient to put weight on the strong side during the transfer. Encourage the patient to use his or her arms to assist, as able, and to place them on the caregiver’s forearms. This method maximizes patient support while protecting the care provider from injury. Aid with ambulation; direct the use of ambulation devices such as canes, walkers, and crutches. Stand on the patient’s weak side. If using a cane, place the cane in the patient’s strong hand and ensure proper foot-cane sequence. These methods promote patient safety and aid with balance and support. Telephone: Evaluate need for adaptive equipment through the therapy department (e.g., increased volume, larger numbers, pushbutton phone). Patients will need a useful tool for communicating needs from home. Writing: Provide the patient with felt-tip pens. Assess the demand for a support or splint on the writing hand. Felt-tip pens mark with little pressure and are easier to use. Splints assist in holding the writing device. Assess and note prior and present patterns for toileting; introduce a toileting routine that factors these habits into the program. The efficacy of the bowel or bladder program will be improved if the natural and personal patterns of the patient are taken into consideration. Assess patient’s ability to verbalize necessitate to void and/or capacity to use urinal, bedpan. Bring patient to the bathroom at regular or intermittent intervals for voiding if suitable. Patient may have neurogenic bladder, is lacking concentration, or be able to verbalize needs in acute recovery phase, but often is able to recover independent control of this function as recovery develops. Provide privacy while patient is toileting. Lack of privacy may reduce the patient’s ability to empty bowel and bladder. Give bedpan or put patient on toilet every 1 to 1½ hours throughout day and three times throughout night. This eradicates incontinence. Time intervals can be prolonged as the patient starts to verbalize the need to toilet on demand. Give suppositories and stool softeners. May be essential at first to help in instituting normal bowel function. Observe closely patient for loss of balance or fall. Maintain commode and toilet tissue close to the bedside for nighttime utilization. Patients may hurry readiness to ambulate to the toilet or commode throughout the night due to fear of soiling themselves and may fall in the procedure. Keep call light within reach and teach patient to call as prompt as possible. This facilitates staff members to have ample time to help with transfer to commode or toilet. Aid patient in eliminating or changing unnecessary clothing. Clothing that is not easy to get in and out of may compromise a patient’s capability to be continent. Consider utilization of commode or toilet as early as possible. Patients are more successful in emptying bowel and bladder when sitting on a commode. A number of patients find it unfeasible to toilet on a bedpan. Recognize prior bowel habits and restore normal regimen. Increase bulk in diet, fluid intake, and activity. Supports in progression of retraining program and helps in avoiding constipation and impaction. Educate family and significant others to promote autonomy and to intervene if the patient becomes tired, not capable of carrying out task, or become extremely aggravated. This displays caring and concern but does not hinder with patient’s efforts to attain autonomy. Inform family members to allow the patient perform self-care measures as much as possible. Reinstitutes feeling of independence and promotes self-esteem and improves rehabilitation process. Note: This may be very hard and discouraging for the significant other or caregiver, depending on extent of disability and time needed for the patient to accomplish activity. Promote independence, but intervene when the patient is not able to carry out self-care activities. A suitable level of assistive care can avoid harm with activities without causing disappointment. Entertain patient input in planning schedule. Patient’s worth of life is improved when wishes or likes are taken into consideration in daily activities. Consider or use energy-conservation techniques. This saves energy, decreases fatigue, and improves patient’s capability to execute tasks.